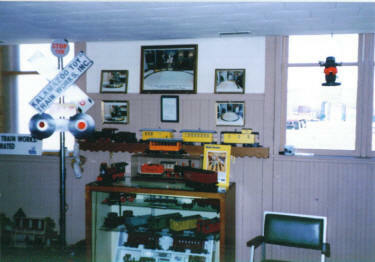 A room was set up in the depot as a display area. Notice the photos above the case of President Reagan's train. 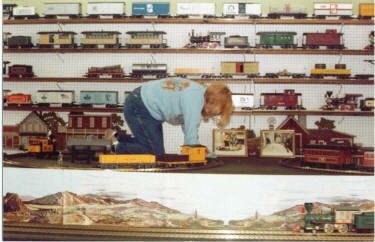 The Millers traveled to numerous shows across the country and set up displays for their line of toy trains. 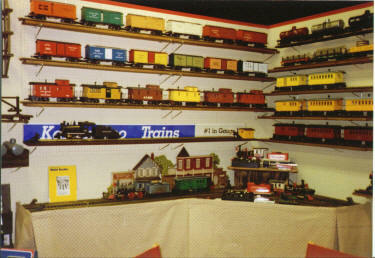 A trade show display. These displays were carefully orchestrated. This train was purchased as a present and given to the recipient as a surprise at a large party. Sadly, the Bangor Toy Train Factory succumbed to a cheaper, lower quality foreign market. 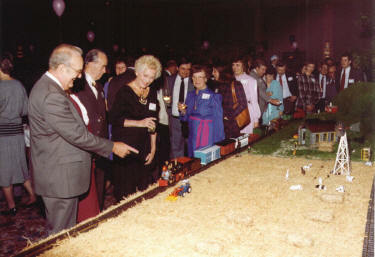 The Kalamazoo Toy Train upheld its standard to a quality product, but could not overcome the competition. Thousands of trains were produced and have now become collectors items. They left a legacy that the community of Bangor can be proud of.